ISRO's GPS Aided GEO Augmented Navigation system (GAGAN) (see ISRO and Wikipedia) is the first GPS augmentation system designed to deal with ionospheric effects near the geomagnetic equator. Further, GAGAN is the first system in the world that would be certified to serve the equatorial anomaly region with its unique IONO algorithm (IGM-MLDF: ISRO GIVE Model Multi-Layer Data Fusion) designed and developed by ISAC in collaboration with vendor. What is the equatorial anomaly, and what is unique about the IONO algorithm and how it handles the anomalous ionospheric effects? Why don't other systems have this? Characterized as the occurrence of a trough in the ionization concentration at the equator and crests at about 17 degrees in magnetic latitude [Appleton, 1946] in each hemisphere, the equatorial anomaly has been well described as arising from the electrodynamics at the equator. Tidal oscillations in the lower ionosphere move plasma across the magnetic field lines which are horizontal at the magnetic equator. 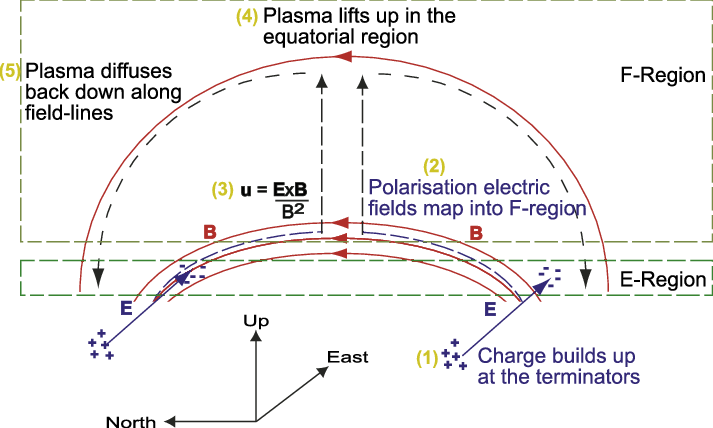 The resulting E-region dynamo sets up a intense current sheet referred to as the equatorial electrojet. The zonal current flows eastward during the day and westward at night....The equatorial anomaly is often not symmetrical about the magnetic equator due to the interaction of the neutral wind. The asymmetry tends to produce the largest peaks in the winter season, since the neutral winds usually cause plasma to be pushed from the summer to the winter hemisphere. Also due to the declination of the earth’s magnetic field, the characteristics of the anomaly regions differ with longitudes. The anomaly regions in the southeast Asia sector would be unique due to stronger trapping of higher energy particles at a given altitude. Radio scintillations due to presence of moving irregularities in the ionosphere is a major problem in Navigation applications using GPS and in satellite communication, SATCOM especially in low latitudes, the problem being particularly acute around equatorial anomaly peak region Scintillation refers to rapid phase and amplitude fluctuations of the radio signals observed on or near the earth’s surface... If sufficiently intense, these fluctuations can dramatically impact the performance of space-based communication and navigation systems. Ionospheric scintillation is the most significant disturbance that can affect GPS users during years of high sun spot activity. In the presence of scintillation, ionospheric modelling can be rendered impractical and receiver performance can be severely degraded. The influence of the ionosphere and a strategy to isolate its effect are issues of major concern for GPS positioning and navigation applications...The ionosphere affects GPS receivers by degrading the signal performance, in some cases causing loss of carrier lock, and by degrading the accuracy of differential corrections. These affects are caused by irregularities of electron density those scatter radio waves at L band frequency and generate amplitude and phase scintillation. So as a result of the ionosphere's variations at the equator, typical GPS systems can become highly inaccurate, or lose signal lock altogether, because of the variability of the signals. Finally, an article in Inside GNSS (Global Navigation Satellite Systems) describes how GAGAN works to correct this. In order to model the vertical movement of the ionosphere, the IGM-MLDF Model is designed to capture the ionosphere variability at two different ionospheric electron shell heights and finally provide a value for the user at a 350-kilometer shell height using a weighted average method. The model ensures that the broadcast GIVEs (defined earlier in the article as grid ionosphere vertical error) have a sufficiently high level of integrity so that the user ionosphere vertical errors (UIVEs) computed by user receivers will bound their vertical ionosphere errors with a very high probability. The GIVE guarantees the integrity of UIVEs, not only at the grid point but at all points of the four grid cells surrounding the grid point. The algorithm provides the delay and the confidence values for the user, resulting in improved accuracy and availability. So GAGAN will be able to provide an error correction signal for receivers so that they can reduce the errors caused by the variability in the height, direction, and density of the currents ionosphere. As for why other satellites don't do it, I would assume primarily because there isn't a significant need for it in the countries who developed the system. The four major positioning satellite systems in use; GPS, GLONASS, BeiDou, and Galileo are all operated by countries that are very far away from the equatorial region, with the exception being parts of China. (This paper indicates that BeiDou DOES suffer as a result of the scintillation, an impact on accuracy up to 6 meters.) 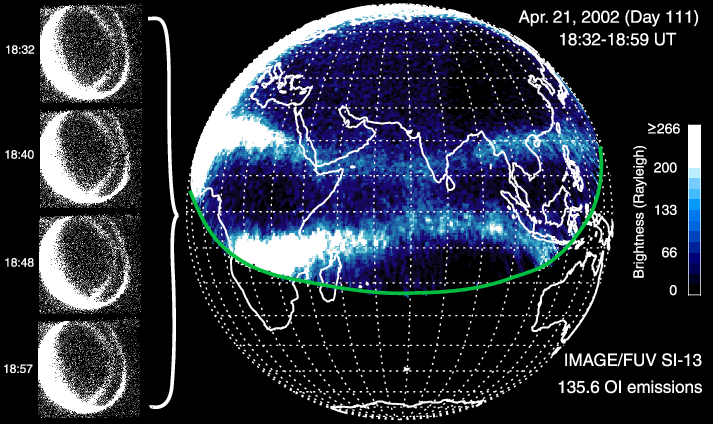 However, as you can see in this graphic, the anomaly can cross directly above a significant portion of India. Not the answer you're looking for? Browse other questions tagged isro gps gnss or ask your own question. Why did ISRO require additional tracking ships in the South Pacific for its MOM mission? How large is the Earth's gravitational Sphere of Influence and how can it be calculated? What are RAIM Service Outage, RNP and EnRoute on GPS DOP maps? What does the red line mean?